AMG’s fearsome coupes are getting a sedan sibling, though the 2019 Mercedes-AMG GT 4-Door Coupe is no compromise on the sports front. Unveiled officially at the Geneva Motor Show 2018 this week, the new four-door borrows the aggressive design and focus on performance of its two-door cousins but makes the whole thing more practical. Well, as practical as up to 630 horsepower can ever be. The family resemblance is clear. The AMG GT R has donated much of its stylistic DNA, though stretched to accommodate two back doors and a more spacious trunk. The hood is low and long, with twin powerdomes bulging through the sheet-metal. The sizable grille is flanked by multibeam LED headlamps, while the side windows are frameless and lower to emphasize the coupe comparison. Oversized rear arches dominate the back of the car, while the rear lamps are slim LED slashes. A Night Package throws in high-gloss black trim, while at the other extreme the Chrome Package swaps that out for high-gloss chrome. There’s not one but two Carbon-Fiber Packages, with different flavors of the race-friendly material. Three versions of the car will be on offer, though even the tamest still promises to be a beast in the four-door segment. That’s the AMG GT 53, packing the AMG-enhanced 3.0-liter Inline-6 turbo engine with EQ boost. That’s good for 429 horsepower, bumped up by as much as 21 HP and 181 lf-ft of torque courtesy of the add-on electric motor. AMG says it should so 0-60 mph in around 4.4 seconds, on to a top speed of 174 horsepower. 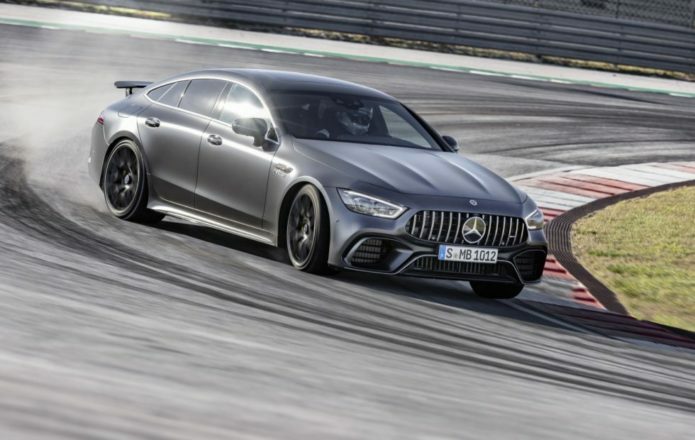 The real kicker, though, will be the remaining two models: the AMG GT 63 and GT 63 S. Each uses the AMG-made 4.0-liter V8 biturbo, tuned to 577 HP and 553 lb-ft in the GT 63; that makes for a top speed of 193 mph, and a 0-60 time of approximately 3.3 seconds. In the AMG GT 63 S, meanwhile, you’re looking at 630 HP and 627 lb-ft of torque, with 0-60 coming in an estimated 3.1 seconds and a top speed of 195 mph. AMG’s differences between the two, though, are more than just raw figures. The AMG GT 63 S, for example, packs active engine mounts as standard, automatically adjusting their rigidity according to the current driving conditions. They’re optional on the AMG GT 63, as is Drift Mode, which comes standard on the S-badged variant. Turn on the RACE drive mode and, with ESP shut off and the transmission in manual, you can enable Drift Mode with the paddles. It switches the standard-fit Performance 4MATIC+ all-wheel drive into rear-wheel drive only, unlike the regular cars which automatically shift power front and rear – and left and right in the GT 63 and GT 63 S, courtesy of an electronically controlled locking rear differential – depending on traction. The V8 cars also get active rear axle steering as standard – not available on the AMG GT 53 – which points the back wheels either in tandem with, or opposite to, the front depending on speed. Up to 62 mph, they point in the opposite direction for a faster turning circle. Above that, they turn in the same direction for improved stability and swifter changes of direction. Electromechanical speed-sensitive power steering with AMG tuning is standard across the tiro, with Comfort, Sport, and Sport+ settings. V8 cars get the AMG SPEEDSHIFT MCT 9-speed transmission, with a wet clutch for reduced weight and swifter shift speeds. That should be particularly noticeable when it comes to rapid-fire downshifts, courtesy of a double-declutching function. AMG bakes in a Race Start function, too. The six-cylinder, meanwhile, gets the AMG SPEEDSHIFT TCT 9-speed. That uses a torque-converter, and adjusts its shift patterns according to the drive mode. It also gets steel spring suspension with adjustable damping, while the V8 cars get AMG RIDE CONTROL+ multi-chamber air suspension. Up to six drive modes are available through the AMG DYNAMICS system. Spanning “Slippery” through “Comfort,” “Sport,” “Sport+,” “RACE,” and “Individual,” they also modify the Basic/Advanced/Pro/Master agility functions that control elements like when the ESP weighs in and how the all-wheel drive balances power. If you just the whole thing to sound better, mind, there’s an exhaust system flap control too. At the opposite end, of course, there’s stopping. The V8 models get compound discs with 6-piston fixed calipers at the front, and single-piston floating calipers at the rear. On the GT 63 they’re red, while the GT 63 S finishes them in yellow. The AMG GT 53 gets internally ventilated and perforated compound discs with silver-painted 6-piston front brake calipers. However, both V8 cars can optionally be fitted with AMG’s ceramic brake system. That gets 6-piston fixed calipers at the front and single-piston at the rear, finished in bronze, with a cut in weight over the regular set. As standard, the AMG GT 53 and GT 63 have 19-inch 10-spoke disc wheels, while the GT 63 S wears five twin-spoke 20-inch light-alloys. Options up to 21-inches will be available from AMG. The aero work is surprisingly subtle. At the front, there’s an “AIRPANEL” active air control in the bumper, borrowed from the AMG GT R coupe. It has louvers that open and close rapidly, shifting airflow between cooling and aerodynamics. At the rear, a multi-stage spoiler changes its angle according to driving conditions. The Aerodynamics Package is optional, with extra aero-flics and a larger front splitter. It gets a new diffuser, too, and a fixed rear spoiler – optionally in carbon fiber – with three-position manual adjustment. Hair-raising performance needn’t demand hair-shirt accommodation, of course, and so the cabin gets the tech of the S-Class but with a racing twist. The dashboard flows around the driver, into the door trim, with turbine-look air vents and twin 12.3-inch dashboard displays as standard. It goes beyond what the S-Class version offers, though, and AMG bills it as a sort of three-in-one deal, with three instrument cluster styles to suit the driver’s tastes or situation. The Classic is your old-school option, with the traditional round meters needles, while the Sports style is the mode that it shares with S-Class and E-class models. Completely new – and exclusive to the car – is the Supersports sports style, putting the tachometer right in the center and adding extra colors, effects, and animation. For example, when driving in manual gear with a very high RPM, you will eventually reach an upshift: at that point, the entire display flickers red, not unlike the effects you’d get in video games to call your attention. The new AMG Performance Steering Wheel has touch-control buttons for navigation, and optionally gets a round-controller with its own integral display to switch drive modes. On the opposite side, you get an odd-looking two-button control that offers shortcuts to key AMG features. Each button has a small LCD on above them that do more than display the associated setting. Touch them and you can select which setting will be changed when you press the appropriate button. It’s not the only embedded screen tech Mercedes-AMG has used. The center console gets color-display buttons, showing transmission, suspension, ESP, exhaust system, start/stop, and rear spoiler position status. Capacitive switches handle drive programs and volume control, as well as features like the summoning the reversing camera, and switching between the navigation, radio, media, phone, and settings modes. As your finger nears, the function automatically highlights in the UI, so you don’t need to look down to see where your fingertip is pointing. Multiple seat options are available. In the US, all AMG GT 4-Door Coupe models will have four seats; other geographies will get a bench rear seat option too. An Executive Rear Seat Package will have a touchscreen controller integrated between the back seats. Passengers at the back can change radio stations or songs without having to bother the driver. They can also change the ambient light in a rather interesting way. The AMG GT 4-Door Coupe has different color zones, so you can have a different ambient light at the back from the one in front, almost perfect for keeping kids entertained or at least mystified. In the front, there’s everything from comfort options with diamond quilting, through to contoured performance seats with integral head restraints. Features like the S-Class’ adjustable multi-fragrance HVAC system and ENERGIZING comfort control can be had as options. Arguably more interesting to keen drivers is AMG TRACK PACE. Built into the COMAND infotainment system as standard, it collects lap times and collates it with car data with 80-different metrics: everything from lateral and longitudinal acceleration, accelerator and brake position, and steering angle. It’ll figure out drift angle, too, and then allow for easy lap comparisons with color-coding for the parts you aced and the sections you could do better in. In the US, the 2019 AMG GT 4-Door Coupe will begin shipping in early 2019, though only in AMG GT 63 and GT 63 S forms. The 2019 AMG GT 53, meanwhile, will follow on in mid-2019. Pricing, Mercedes-AMG says, will be confirmed closer to launch.